In addition to being the fourteenth film in the Marvel Cinematic Universe, Scott Derrickson's Doctor Strange plays out like a microcosm of the juggernaut that birthed it. Like the MCU itself, Strange starts out relatively normal, gets odder as it goes along, is plagued by a lack of compelling antagonists, and is better at wry comedy than action or spectacle. For all the flashes of weirdness that are allowed to creep in around the edges, it is a quintessential Marvel movie, with all the positives and problems that entails. The basic Marvel structure is so familiar at this point that the opening half-hour feels almost like a hyperlink version of an origin story. More than Iron Man, Captain America or even Ant-Man, the film relies on surface level signifiers to establish who Stephen Strange (Benedict Cumberbatch) is, instead of actual details. He's introduced conducting a highly specialised piece of neurosurgery while showing off his encyclopedic knowledge of '70s funk hits to a subordinate, then rushes off to prove that another doctor (Michael Stuhlbarg) has wrongly declared a patient braindead, before saving that patient's life with mere seconds to spare. Couple that dizzying display of skill and arrogance with his lavish Manhattan apartment and frosty relationship with former lover Christine Palmer (Rachel McAdams) and you have all the markers of a super genius who has trouble connecting to other people and an overdeveloped narcissistic sense of his own importance. You don't need to know anything about his family history (Doctor Strange is one of the few Marvel movies not to at least partly revolve around the death of, or estrangement from, the protagonist's parents), the details of how he got to be so rich, or to have any real sense of their place in the world to know that this is a Marvel hero. It puts Strange in the Tony Stark mold and presumes that the audience will fill in the gaps as the story moves along. That unwillingness to get bogged down in storytelling beats that we can recite by heart lends the film a pleasant rapidity as Derrickson hurtles through the salient information, but it also makes the opening act feel rushed. There's a balance to be struck between accepting that the audience is savvy enough to be familiar with, if not outright bored by, the standard formula, and delivering a satisfying version of said formula, and Doctor Strange largely fails at maintaining it. The speed with which the film moves from introducing Strange, to the car accident that destroys his hands, which in turns sends him spiraling into despondency and desperation, and ultimately to a sect of mystical sorcerers led by the mysterious Ancient One (Tilda Swinton, whose intrinsic greatness never overcomes the sense that her part should have been played by an Asian actor, or that Derrickson and his co-writers, Jon Spaihts and C. Robert Cargill, should have worked harder to make her casting in that role make sense, rather than just putting her in Tibetan trappings and saying, "Eh, good enough.") doesn't leave much room for grace notes or humour. It may be the first superhero movie to display as much impatience with its first act table setting as its audience does. Once the story moves to Kathmandu and Strange begins training with the Ancient One, the film settles down and things become a lot more fun. 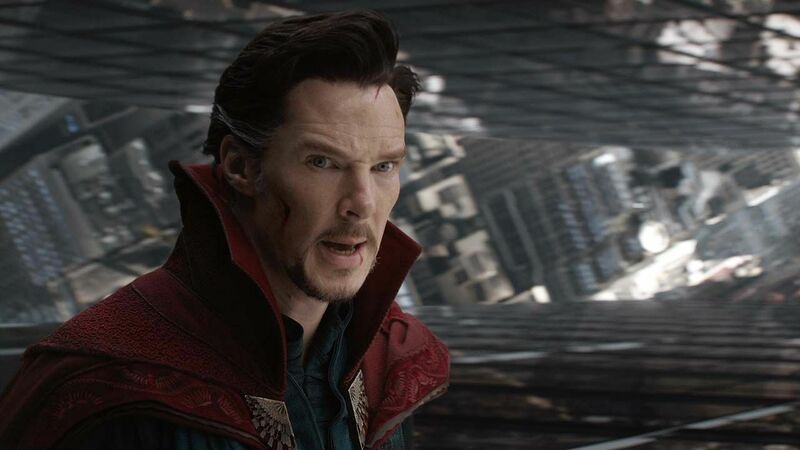 That's partly because the film takes a little time to slow down and establish Strange's rapport with fellow sorcerers Mordo (Chiwetel Ejiofor) and Wong (Benedict Wong), allowing for scenes to focus on how annoying a gifted know-it-all like Strange is to his more reserved colleagues, but also because the film gets more ridiculous, while also making fun of its own ridiculousness. Although the film opens with the Ancient One chasing Kaecilius (Mads Mikkelsen), a former student turned enemy, through a constantly shifting, twisting and upending London, the visual inventiveness only really kicks into gear when Strange is subjected to a surreal, funny, and at times unnerving vision in which he is at one point hurtled through a 2001-esque colour assault, and at another consumed by an infinite number of hands that grow out of his own fingers like rivulets from a flesh river (a moment that hints at Derrickson's past work in the horror genre). It's the most audacious sequence in any Marvel movie to date, and taps into the phantasmagoric potential of its source material in a way that probably wouldn't have been allowed four or five years ago, but now is, thanks to the conservative, gradual weirding that has typified Disney and Marvel's approach to their universe. It's such a striking sequence, particularly in how it manages to encompass a lot of different tones at once while being visually arresting, that the more action-heavy sequences that follow fall flat in comparison. There's certainly something awe-inspiring about watching cities split into fragments, twist into new shapes, or flip around to exploit shifting gravity (Doctor Strange owes a heavy debt to the visuals of Christopher Nolan's Inception in this regard, as opposed to all the blockbusters released since 2010 which merely mimicked its cacophonous soundtrack) but once that dies down, you're left with fairly standard hand-to-hand combat sequences that happen to take place in, rather than take advantage of, an interesting environment. While the finale, which sees Strange manipulate both space and time in clever, darkly funny ways, proves to be more innovative and playful, the effects mostly tend to be more impressive than revelatory. At the same time that the visuals get crazier, the film's sense of humour becomes wryer and more self-effacing. There aren't a lot of laughs in the brooding New York section, but as an outsider to this world of magic and metaphysics, Strange constantly makes sarcastic remarks about how weird his situation is. But the other sorcerers are allowed to be funny as well, such as when Mordo hands Strange a piece of paper with a single word on it, and when Strange asks him if it's a mantra he says that it's the wifi password. Undercutting pomposity to establish its reality has been Marvel's go-to reflex since the first Iron Man, so it's hardly surprising that the film with the most obvious capacity for being ridiculed is the one that most consistently makes fun of itself (as evidenced by the way in which Strange's Cloak of Levitation, an article of clothing that is inherently silly outside of a comic book context, is akin to the magic carpet in Disney's Aladdin: a sentient companion who is both comic relief and valuable asset). As has so often been the case with the MCU, casting charismatic actors and giving them funny things to say (even in Cumberbatch's shoddy New York(?) accent) turns out to be a pretty smart choice. At least it is for the heroes. The villains of the piece are almost entirely humourless, which puts them in the same generic bracket as the Dark Elves from Thor: The Dark World rather than Loki, which is a terrible shame because, as anyone who has watched Hannibal (or almost anything he's ever been in) will attest, Mads Mikkelsen is great at being both terrifying and hilarious, but here he's neither. The one time that he's allowed to crack a smile - when he misunderstands Strange's insistence on being called "Doctor" and assumes that's his name - it makes for one of the funniest moments in the whole movie, and a welcome relief from the rest of his performance, which consists largely of glowering and saying "Dormammu". Now, I'd happily watch Mikkelsen glower and say "Dormammu" for hours, but that one moment of levity highlights how close the film came to escaping Marvel's ever-present villain problem by casting the perfect actor, then giving him nothing to do. As was the case with Ant-Man last year and Guardians of the Galaxy the year before, Doctor Strange reinforces the sense that, as the MCU nears its tenth anniversary, as its core Avengers movies (and quasi-Avengers movies like Civil War) grow more interconnected and weighed down by the demands of continuity and building the franchise, it's the offshoots around the edges that are the most promising. There's every chance that all the fun will be sucked out of Stephen Strange and his particular corner of the Marvel map when he gets drawn into a broader conflict, as happened with Steve Rogers, Tony Stark and, to a lesser extent, Thor, but that's a problem for another film. For now, Scott Derrickson has delivered one of the more ambitious and inventive installments in the Marvel canon, a blockbuster with imagination to spare, even if it's focused primarily on visuals instead of story or characters.